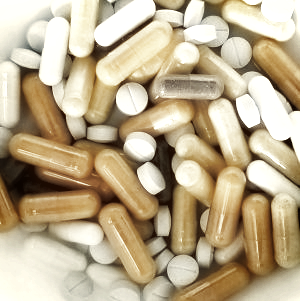 One of the things I get asked about most commonly is whether a specific supplement is good or not. We’re inundated by articles touting the efficacy of the “next big cure,” the “one simple thing” to drastically change your life. We’re also overwhelmed with scary excerpts from studies demonizing seemingly innocuous every day things, talking about toxic supplements, and exposing misleading claims. The vitamin and supplement industry is just that, an industry, and one that is not well regulated by the FDA. That being said, I strongly disagree with slanted, poorly constructed studies and articles written by people with very limited knowledge of the subject matter. (Gosh, a study on an herb’s desiccated leaves in healthy people shows no benefit…not surprising when its standard herbal preparation is root extracted in alcohol and administered for a specific condition.) I also strongly disagree with the plethora of advertisements and companies that seek to take our money by preying on our fears and desire for wellness, while providing a sub-standard product. It is certainly a waste of money and possibly even a danger to your health to take unnecessary supplements, things that don’t actually do what you want them to do, and don’t actually contain what you think they do. In the makings of a perfect storm, not only do we have limited healthcare resources to help understand what vitamins or supplements we may need, we are also barraged with advertisements for seemingly helpful supplements. Time and time again, I am disappointed to see vitamin supplements that have great, necessary nutrients…just in a minimally absorbable form. They can also be combined with less-great substances that actually end up blocking the intended nutrient. Oils are frequently contained in potentially harmful containers that could leech into and contaminate the substance you’re taking (so much for the health benefits). Alternately, I see suggested serving sizes that are ridiculously inconsistent with standard dosing. This makes your seemingly inexpensive supplement end up being veritably useless, unaffordable at proper dosing, or unpalatable (I’m looking at you, pile of horse pills). This leaves the average person unlikely to achieve therapeutic targets (and more importantly, feel the results) that they intended. You may have guessed from this article (or from seeing me with an arched eyebrow perusing the supplement sample at our grocery store), frankly, I get a bit upset. If your questions aren’t answered sufficiently by your healthcare team, or you want to get started with optimizing rather than just treating, feel free to reach out to me, Dr. Overland. I’d be happy to schedule a visit with you to evaluate your treatment plan and streamline your supplements.